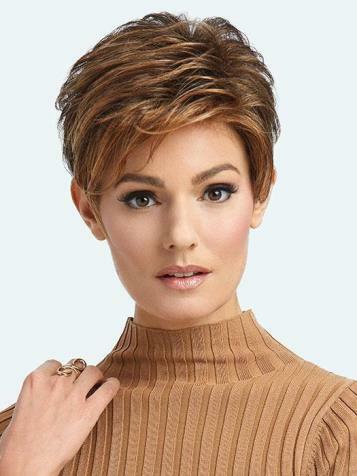 The Advanced French Wig is a free-formed windswept look in a short pixie with longer layers throughout the top and crown combining with loose textured lengths. Added excitement and shaping of a smooth head hugging nape completes the look. Easy wear comfort with a cap construction learning the shape of your head for what feels like a custom fit. 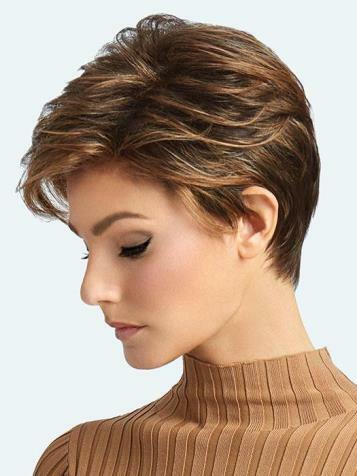 This feminine silhouette worn as is, or heat styled is made in Tru2Life heat-friendly hair. Create varied looks depending on your mood. A temple to temple lace hairline, designed ready-to-wear adds a hint more realism. Style on or off the face. A Sheer transparent lace front, blends with all skin tones for the most natural hairline available. This style is suitable for Oval, Round, Diamond, Pear & Heart shaped faces. Front: 4" Crown: 4" Sides: 1.75" Back: 3.35" Nape 1.75"